也许你会觉得有点奇怪的是 friend struct QScopedPointerDeleter<ConfigUtil>，为什么是声明 QScopedPointerDeleter 为 friend struct，而不是声明 QScopedPointer 为 friend class? Arrays as well as pointers that have been allocated with malloc must not be deleted using delete. 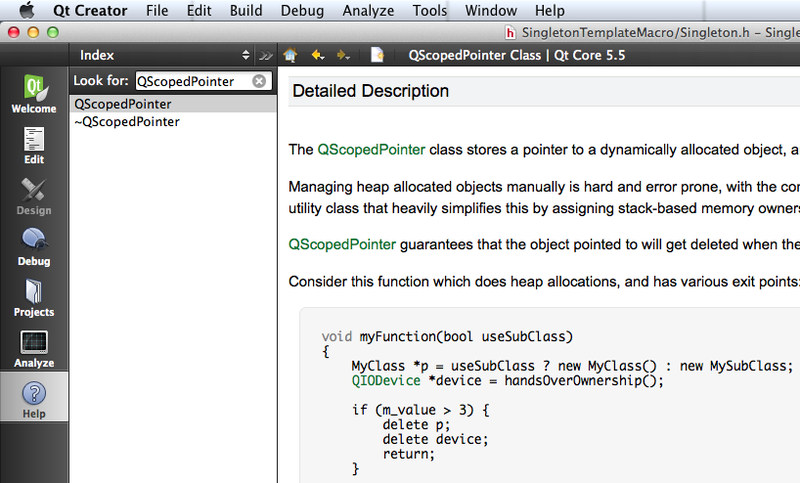 QScopedPointer’s second template parameter can be used for custom cleanup handlers. QScopedPointerDeleteLater - deletes a pointer by calling deleteLater() on it. Use this handler for pointers to QObject’s that are actively participating in a QEventLoop.